I'm annoyed that I didn't take more photos of this project as I went along but there was a movie on while I was doing it so I was a bit distracted. Anyway it isn't rocket science so you should be fine. I got the inspiration for this idea from Tater Tots & Jello but she cheated because she used pre-ruffled fabric. Just saying. Start by cutting your chosen fabric into inch wide strips, make sure your fabric piece is long enough to wrap all the way around your lamp. I was only using a little lamp shade so I didn't have to worry too much about this. You can vary the width of your strips depending on what type of look you want, I wanted a textured look so I made mine fairly close together when I applied them. 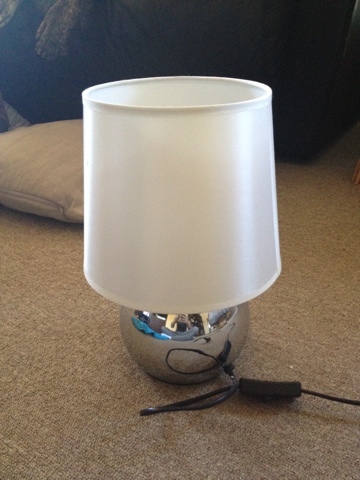 My $10 lamp from Kmart. I'm sure you can find one at an op shop (thrift store). A pillowcase my boss was throwing out. 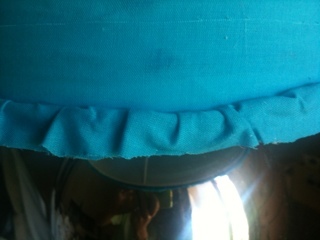 Next you can start hot glueing your pieces of fabric around the lamp starting at the top and working your way down. Be sure to keep the strips taught as you go around if you want a "Mummy" type look. I wanted mine to be flat but if you want more of a "ruffled" effect just don't be so pedantic about applying it smoothly. While applying the strips you can go perfectly across and make straight lines or you can be a little messy and make them go up and down a bit, I chose the latter. J suggested I make them straight and even, but the lamp is on my side of the bed. Once you are finished wrapping your "mummy" strips around the lamp you need to cap off the top and bottom to give it a finished and neat look. I used a nice even piece from my strips for the top and just hot glued it over the top of the other strips. 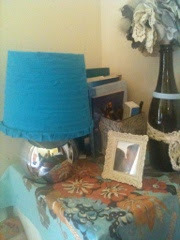 For the bottom I used the left over ruffle pieces from the pillowcase. I hot glued it on as a whole piece (wish I had photos) and then trimmed it down so it just barely hung past the edge of the lamp. J liked it with the long granny ruffle but I didn't because it looked like a jellyfish, apparently that is what he found appealing about it. 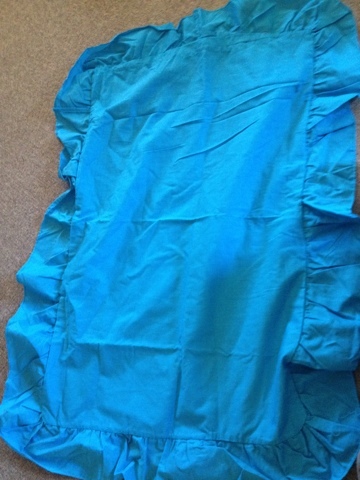 The ruffled edge from the pillowcase that I just cut down. I made it uneven because I like the roughness. I love it lit up, it looks so much more textured. I had to use my phone for this photo so it isn't the best image. Sorry. (an old box that I covered with a vintage tea towel (kitchen towel) from J's mom's house. I am currently trying to find a pretty ribbon to tie around it to just finish it off. 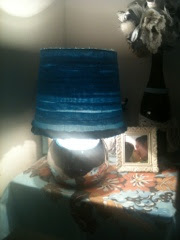 But for now I am happy with my funky little lamp. I think it adds some much needed colour to our bedroom. That's a cute littl diy!